After the early success of the L's, Ned decided to try and offer a more affordable version of his creation at a price just under $1000. These new instruments would feature graphite necks, small wooden bodies and feature the same hardware but less costly passive pickups. These models were designated the P series. GP's and XP's can be identified by the smaller arrow or mini-V shaped body. They are often confused with the original L's since they both have similar smallish bodies. Though roughly the same size, the P's feature a decidedly angled V or arrow shaped body style, always with a pickguard. 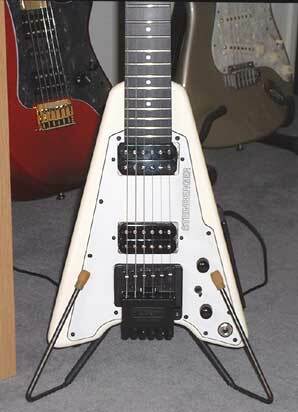 The addition of pickguards allowed the company to offer different configurations on the same body - which helped to keep manufacturing costs down. and an angled, engraved logo. This one has low impedance (active) EMG pickups. 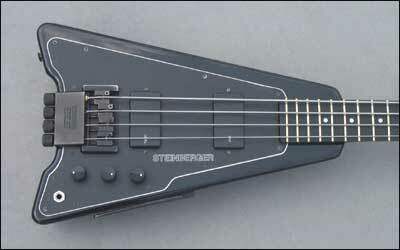 Regarding the pickguards, it should be noted that Steinberger used several suppliers throughout production. 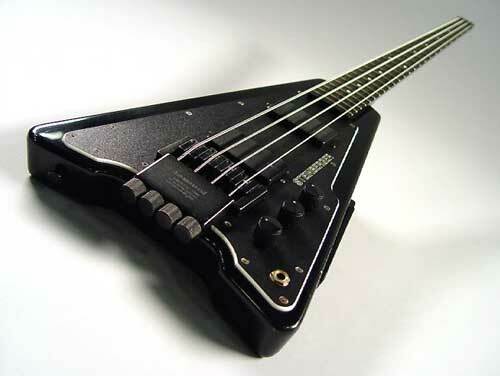 The first orders were from WD Pickguards (then in NY, now in FL) and later went offshore to a Japanese supplier. WD still has the original templates and though not listed on their website original dimension pickguards can be special ordered. Replacement P pickguards can also be ordered from Chandler as well. Likewise there were also many variations in the pickguard material itself. The earliest ones have a smooth laminated pickguard with an embossed (akin to a silk-screened) logo. They then went on to a highly textured laminated pickguard with an engraved logo. The majority of the P's we've seen have these. Still other have more of a light matte finish again with an embossed logo. All of these are factory originals. The laminates were usually (but not always) a 3 ply design with the top and bottom layers the same color as the body and the middle layer a contrasting color, usually white. The edges were beveled to show sandwich edge of the laminate. The engraved logo would then prominently show in the same white color. The tough, scratch-resistant, highly textured material was a special order. No current pickguard companies seem to offer this material for replacement pickguards. and the original pickguard appears to have been replaced with a newer one. 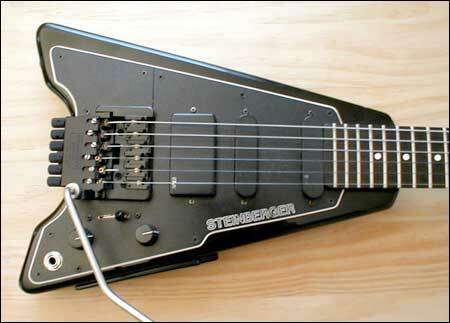 The P's featured high impendence (passive) EMG pickups designed exclusively for Steinberger. The telltale sign for a passive Steinberger EMG is that the logo is on the middle side of the housing rather than in the corner. These passive pickups were custom made and are different from the later passive Selects that EMG currently makes. Most instruments also came with passive electronics. Because of this most don't need a battery at all - either for the pickups or the EQ.